The Florida grasshopper sparrow (Ammodramus savannarum floridanus) is one of the most endangered birds in Florida with less than 50 breeding pairs left in the wild. 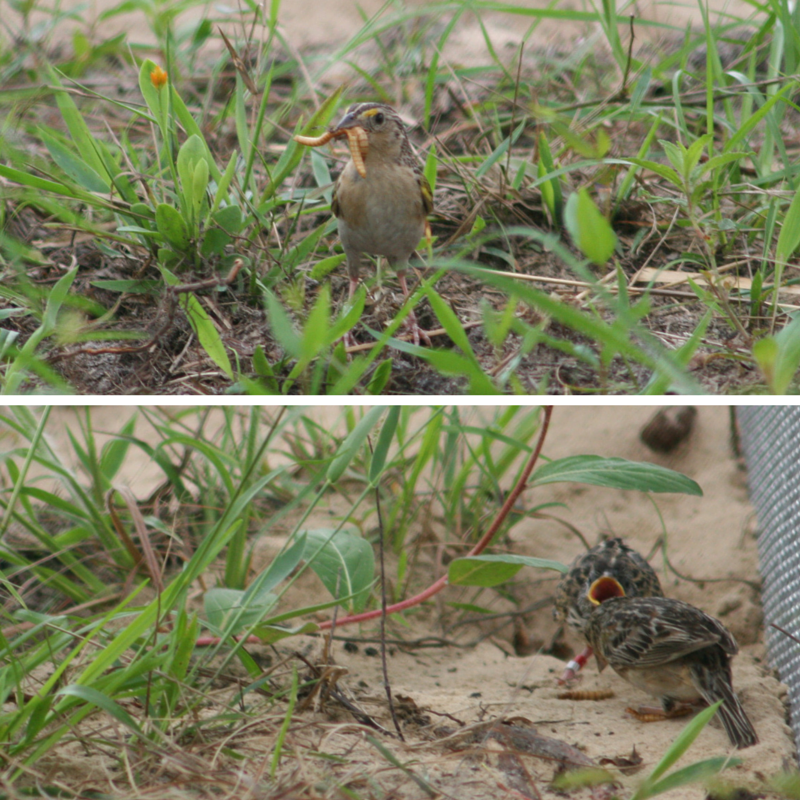 In 2015, White Oak, in cooperation with the US Fish and Wildlife Service (FWS) and the Tall Timbers Research Station (Tall Timbers), began a captive breeding program with a close relative to the Florida grasshopper sparrow, the eastern grasshopper sparrow (A. s. pratensis). Our plan is for the protocols we develop with the Eastern sparrow will guide future conservation breeding of the Florida grasshopper sparrow in an attempt to save the species. Watch this video to learn more about the cooperative work to save the Florida grasshopper sparrow. On May 6th, 2015, Jim Cox of Tall Timbers, delivered seven wild eastern grasshopper sparrow eggs collected from an area outside of Bainbridge, Georgia, to White Oak. One egg hatched in transport, and four hatched after 10-11 days of artificial incubation here at White Oak, which is the first time this species has ever been successfully artificially incubated and hatched in captivity. Again in early June, Collection Manager Andrew Schumann received four more eastern grasshopper sparrows from Bainbridge. Under the careful watch of Andrew and his crew, sparrows continue to arrive, including an entire family group that is doing well. Two late-stage fledglings received from Jim Cox and the team of Tall Timbers Research Station. The birds were captured in Georgia and found by a dog trained to find these birds. These two will be acclimated to captivity at White Oak and socialized with our three other Eastern Grasshopper sparrow chicks. These are the oldest grasshopper sparrows we have received from the wild thus far, and likely first time it has been attempted; we will be developing protocols on captive husbandry and management to aid us when we bring Florida Grasshopper sparrows into captivity. Grasshopper sparrows weigh no more than one ounce as adults. Their cryptic coloration and habit of living and nesting in the grass make them almost invisible. They forage on the ground for small invertebrates, especially grasshoppers, and seeds. The nest of a grasshopper sparrow is a well-concealed ‘cup’ on the ground under vegetation. Females incubate three to five eggs for approximately 12 days. Chicks fledge the nest at around eight days of age but will stay in the area and be fed by the parents for a few weeks. If a nest fails due to predation or flooding (Florida grasshopper sparrows have a nesting success of only 11% in the wild), breeding pairs of grasshopper sparrows may nest again after failure. At White Oak, the birds are housed in large predator-proof enclosures in an effort to increase the likelihood of success. 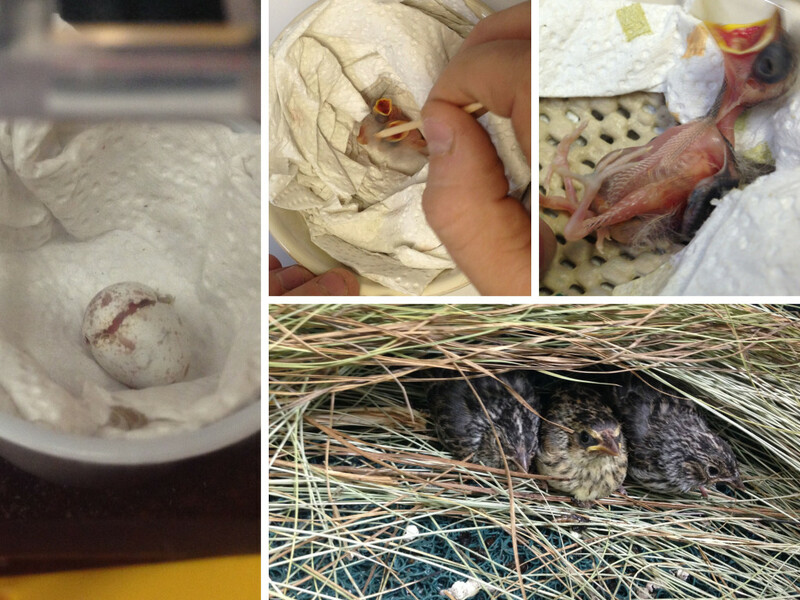 First ever artificially incubated and hatched grasshopper sparrows. Left to right: egg hatching, hand feeding, chick begging, handraised chicks, with a wild-caught fledgling in the middle. The Florida grasshopper sparrow’s decline began in the 1970s when native prairie grasslands were converted to improve cattle grazing pastures, sod production, and agricultural uses. Conservation efforts in Florida to restore native grasslands, along with the conservation breeding program at White Oak and the cooperative efforts with FWS and Tall Timbers may help this critically endangered bird recover. 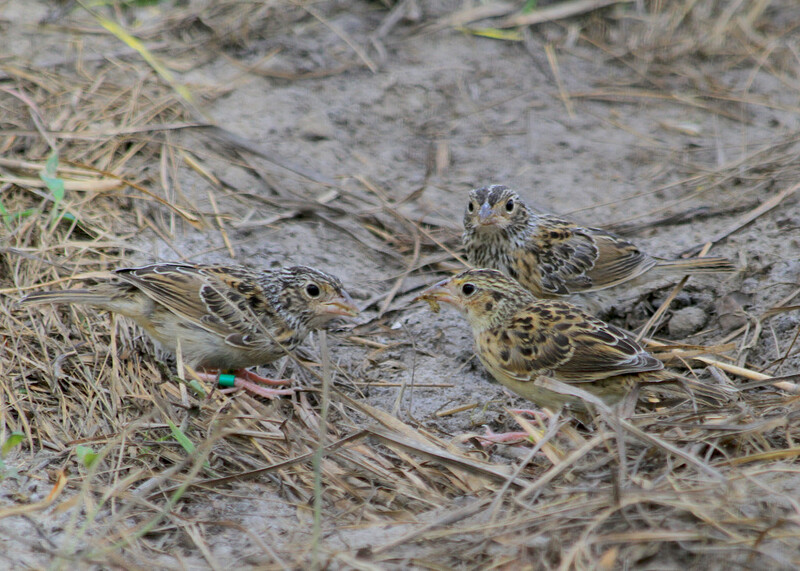 Since 2015, there have been several clutches of Eastern, and Florida grasshopper sparrows hatched at White Oak, an encouraging sign that captive breeding may be an important part of the recovery of this critically endangered species. A female grasshopper sparrow feeds her chick mealworms.